The Battle of Philippi — also called The Philippi Races — was fought on June 3, 1861, in and around Philippi, Virginia (now West Virginia) as part of the Western Virginia Campaign of the American Civil War. It was the first organized land action in the war, but is often treated dismissively as a skirmish rather than a significant battle. After the commencement of hostilities at Fort Sumter in April 1861, Maj. Gen. George B. McClellan returned to the Army and, on May 13, assumed command of the Department of the Ohio, headquartered in Cincinnati, Ohio. McClellan planned an offensive into what is now the State of West Virginia (at that time the northwestern part of the Commonwealth of Virginia) that he optimistically hoped would eventuate in a campaign against the Confederate capital of Richmond, Virginia. His immediate objectives, however, were to occupy the territory to protect the predominantly pro-Union populace of the area, and to keep open the Baltimore & Ohio Railroad line, which was a critical supply line for the Union. On May 26, McClellan, in response to the burning of bridges on the Baltimore & Ohio near the town of Farmington, ordered Colonel Benjamin Franklin Kelley of the (Union) 1st Virginia Infantry, with his regiment and Company A of the 2nd Virginia Infantry, to advance from Wheeling to the area of the sabotage and secure the important bridge over the Monongahela River at Fairmont, a distance of about 70 miles (110 km) southwest of Wheeling. In this Kelley's men were supported by the 16th Ohio Infantry under Col. James Irvine. After securing Fairmont, the 1st Virginia advanced again and seized the important railroad junction of Grafton, about 15 miles (24 km) southwest of Fairmont, on May 30. 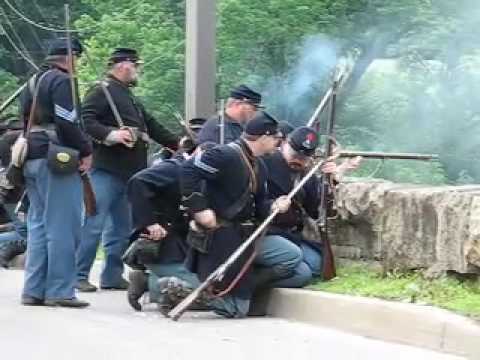 Meanwhile, the 14th Ohio Infantry Regiment, under Col. James B. Steedman, was ordered to occupy Parkersburg and then also proceed to Grafton, about 90 miles (140 km) to the east. By May 28, McClellan had ordered a total of about 3,000 troops into Western Virginia and placed them under the overall command of Brig. Gen. Thomas A. Morris, commander of Indiana Volunteers. Confederate Col. George A. Porterfield had been assigned to command of state forces in northwestern Virginia on May 4 and ordered Grafton to take charge of enlistments in that area. As the Union columns advanced, Porterfield's poorly armed 800 recruits retreated to Philippi, about 17 miles (27 km) south of Grafton. At Philippi, a covered bridge spanned the Tygart Valley River and was an important segment of the vital Beverly-Fairmont Turnpike. Col. Kelley devised a two-prong attack against the Confederate forces in Philippi, approved by Gen. Morris on his arrival in Grafton on June 1. The principal advance would be 1,600 men led by Kelley himself, and would include six companies of his own regiment, nine of the 9th Indiana Infantry Regiment under Col. Robert H. Milroy, and six of the 16th Ohio Infantry. In order to deceive the enemy into believing their objective was Harpers Ferry, they departed by train to the east. They de-trained at the small village of Thornton and marched south on a back road (on the same side of the river as Philippi) intending to arrive at the rear of the town. Meanwhile, the 7th Indiana under Col. Ebenezer Dumont were sent to Webster, about 3.5 miles (5.6 km) southwest of Grafton. There they would combine with the 6th Indiana under Col. Thomas T. Crittenden and the 14th Ohio under Col. Steedman. The column, with a total of 1,400 men under the command of Col. Dumont (with the assistance of Col. Frederick W. Lander, volunteer aide-de-camp to Gen. McClellan), would march directly south from Webster on the Turnpike. In this way, the Union force would execute a double envelopment of the Confederates. On June 2, the two Union columns set off to converge on Philippi. After an overnight march in rainy weather, both columns arrived at Philippi before dawn on June 3. Morris had planned a predawn assault that would be signaled by a pistol shot. The untrained Confederate troops had failed to establish picket lines to provide perimeter security, choosing instead to escape the cold rain that fell at morning and stay inside their tents. A Confederate sympathizer, Mrs. Thomas Humphreys, saw the approaching Union troops and sent her young son on horseback to warn the Confederates. While Mrs. Humphreys watched, Union pickets captured the boy and she fired her pistol at the Union soldiers. Although she missed, her shots started the attack prematurely. The Union forces began firing their artillery, which awakened the sleeping Confederates. After firing a few shots at the advancing Union troops, the Southerners broke lines and began running frantically to the south, some still in their bed clothes, which caused journalists to refer to the battle as the "Races at Philippi". 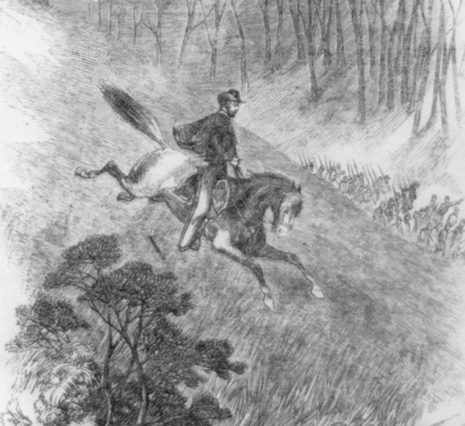 Dumont's troops entered the town from the bridge (Col. Lander's ride down the steep hillside through heavy underbrush was considered such a feat of horsemanship that Leslie's Weekly gave an illustrated account of it shortly afterward), but Kelley's column had arrived from the north on the wrong road and were unable to block the Confederate escape. Col. Kelley himself was shot while chasing some of the retreating Confederates, but Col. Lander personally chased down and captured the soldier who shot Kelley. The remaining Confederate troops retreated to Huttonsville, about 45 miles (72 km) to the south. The victory at Philippi gave a great deal of encouragement to the movement for statehood. The convention that met on 11 July finally adopted the ordinance that would lead to the creation of the State of West Virginia on 20 August. By then Union soldiers had won another victory at Rich Mountain (12 July). By the time the secession referendum was held on 24 October, even Robert E. Lee had been defeated, at Cheat Mountain on 10 September.